Acoustic Booths to house loudspeakers intended to mitigate noise breakout from the Beer Garden of a public house and popular music venue, prompted by noise complaints from a nearby address. To design, manufacture, deliver and install two ‘acoustic booths’ fit for purpose and sized at 1.5m wide x 1.2m deep x 2.65m tall. The Acoustic Booths utilise barrier attenuation to reduce the noise propagation to the complainants address. 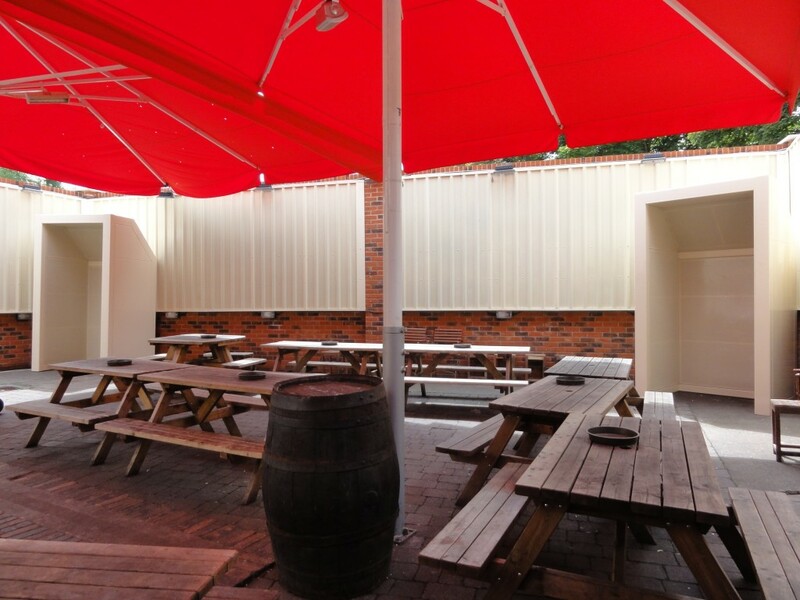 The raked canopy is designed to maximise the barrier effect. 200mm thick booth walls maximise absorption of low frequency noise. Robust, one-piece, welded construction from heavy gauge materials provides not only durability but enables the booths to contain low frequency noise. The booths were supplied in a powder coated finish, providing weather resistance, durability and aesthetic appeal. The booths were powder coated in a colour specified by the customer to match the existing décor. As the booths are situated outdoors, the acoustically absorptive media was encased in a protective polymer film and the structure and perforated metal panels were powder coated inside and out to create a weatherproof finish. Due to limited access to the Beer Garden, the booths included lifting points enabling delivery by simply lifting the booths over the rear wall and into position with minimal disruption. The booths provided a reduction in airborne noise levels in the region of 15dB(A), the maximum level of attenuation that it is possible to achieve using this form of barrier attenuation. The venue has not received any further noise complaints.